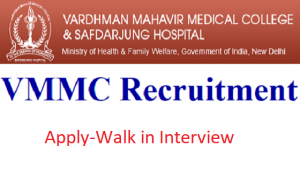 VMMC-SJH(Vardhman Mahavir Medical College & Safdarjung Hospital Recruitment 2019) Notification is finally out! After a long wait, VMMC-SJH(Vardhman Mahavir Medical College & Safdarjung Hospital Recruitment 2019) has finally released an official notification for a total of 84 posts as an assistant professor. Candidates who have been eagerly waiting since a very long time can go to the official website and apply now! VMMC-SJH(Vardhman Mahavir Medical College & Safdarjung Hospital Recruitment 2019) is on a hunt to find extremely dedicated, focused, sincere, and committed who are immediately looking for a job switch and want to boost their careers. It is one of the golden and awaited opportunities for all those hard working candidates, who strive to learn had and want to become future leaders. Those candidates who are eligible and looking for career growth and an excellent opportunity to nurture their soft skills can apply. Total Vacancies: Tentatively 84 in total. Candidates who wish to apply should possess a.Post Graduate Degree/ MBBS/ degree from any recognized university/ institution. Assistant Professor Maximum age limit is 40 years. 2. The candidate who is willing to apply should find the correct VMMC SJH notification link “3-1/2018-Admn.VMMC “Walk-in-interview for the post of Assistant Professor on a contract basis- after finding, the candidate is supposed to open it. 3. Candidates are supposed to read the eligibility criteria, rule and regulations and of the candidate are eligible then he/she should come for the wall-in process. 2. The post is for Delhi Hence, only those candidates shall apply who are flexible in serving in Delhi. VMMC-SJH will be conducting a walk-in drive for all the candidates.